With the rise of corporate responsibility among for-profit corporations and the creation of benefit corporations and low-profit limited liability companies (Cooney, Koushyar, Lee, & Murray, 2014), the nonprofit sector is expanding and in the midst of being redefined. The leaders of these socially minded organizations are finding innovative ways to address social issues, redefining ways to measure social impact, creating new funding models, and are putting pressure on the nonprofit sector to professionalize. Today’s nonprofit leaders are being challenged to compete with these social enterprises while also being held to a higher set of ethical standards (Bowman, 2012). The ethical standards are substantially higher in the nonprofit sector because their mission is to provide a social benefit with income generated through donations and grants. In order to keep up with the sector changes and its high ethical standards, it is difficult to find a nonprofit leader who possesses the experience and the skillsets needed to manage through changes such as these (Callanan, Gardner, Mendonca & Scott, 2014). According to Harry Jansen Kraemer, Jr. (2011).” Today, there is a widespread lack of confidence in leadership, in business, government, education and elsewhere. Every leader needs to regain and maintain trust. Value based leadership may not be a cure for everything that ails us, but it’s definitely a good place to start.” A value-based leader makes decisions and actions rooted in the leader’s ethical and moral foundation (Copeland, 2014). A leader’s values may include, but are not limited to honesty, open communication, humility, integrity, hard work, and compassion (Rao, 2015). By employing their values, a nonprofit leader not only makes decisions based on what’s right for the organization, but they also encourage others to act in a similar manner (Ethical Leadership, 2013). Even though they are leading their organization through difficult times and may not possess all the skillsets needed, a value based leader is able to instill a culture of ethical behavior among employees and volunteers, seek new revenues sources that align with their organization’s mission and the sector, and help create a sustainable organization. Regardless of an organization’s size or mission, employees and volunteers alike respond to the moral cues of their leaders. The tone a nonprofit leader sets is critical in an organization’s culture of integrity (Ethical Leadership, 2013). 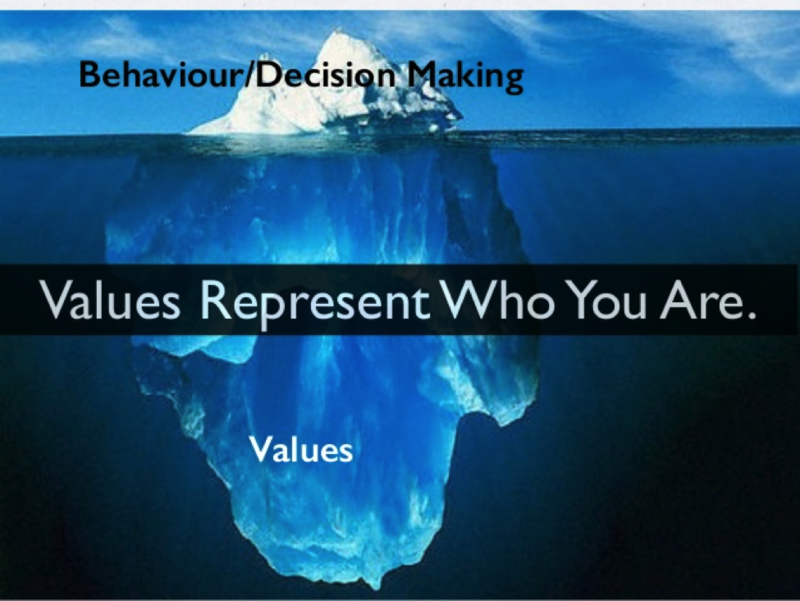 Since no two people have the same set of values or moral judgment, a value based leader adopts and enforces a code of conduct and ethical policies to help clarify what is expected, to try and deter misconduct, promote trust, and minimize conflicts of interests (Rhode and Packel, 2009). Employees and volunteers look to the leader to determine what behavior is acceptable and what is not and will emulate those behaviors. The value-based leader encourages and sometimes demands others in their organization act in a similar fashion. The leader’s values not only influence employees and volunteers, but also impact donors and the organization’s ability to fundraise. The values of the nonprofit’s leader play a critical part when it comes to earning and maintaining the trust of donors and managing their donations in an effective and transparent manner. With the value based leadership approach, the leader values doing what is right for the organization over the dollars (Rao, 2015). This isn’t to say value based leaders do not care about money; instead, the values of the leader and the organization make sure the revenue sources align with the values of the organization and are used effectively. A nonprofit leader has an important role in how an organization fulfills its mission. They also play an integral part in setting and enforcing the values and culture of the organization. Employees and volunteers reflect the values and ethics modeled by their leader. Donors look to the values of a nonprofit organization to determine whether they will invest their dollars or not. The values a leader exhibits in a nonprofit organization often outlive their tenure and can help or hinder the organization in the future. With the entrance of new social impact models, the call for increased transparency, the need to diversify revenue streams and report on the organization’s social impact, nonprofit leaders are faced with a diverse and complex set of challenges. In today’s environment, it is unlikely that a nonprofit leader will possess the experience or all the skillsets needed to lead through these changes. Despite all the challenges a nonprofit leader may face and the high expectation placed on them, a value based leader approach can help navigate through these complexities. By staying true to their values and doing what is right for the nonprofit organization, a value-based leader is able to effectively lead their organization through difficult situations and uncertain times. Not only will the strong ethics of the leader shine through, the strong ethics and values will live on within the organization for years to come. The MNA Program’s mission is to develop effective nonprofit leaders and competent managers to change the world for inclusive, equitable, and sustainable communities worldwide. We envision a world where people, organizations, and societies actively promote and guarantee rights, responsibilities and benefits for all across sectors, shared values, and mutual benefits. We develop value-driven leadership mindsets for social business innovation integrated with professional competencies for sustainable social impact for the social sector and beyond. We value and promote social justice and system thinking in educating women and men-for-others along with other Jesuit values such as cura personals as care for people, planet and prosperity for all. We value and promote Magis as excellence in diversity & inclusion, well-being development & equal opportunities in solidarity with people at the margins. We value and promote Catholic Social Teaching principles such as subsidiarity for shared leadership, women empowerment and good governance. We value and promote innovative, entrepreneur, scalable, impactful and sustainable business solutions to solve complex social problems. We value and promote peacebulding and capacity development for multi-sector partnerships, sustainable human security, asset-based community development, human rights-based approaches, and global-social responsibility. 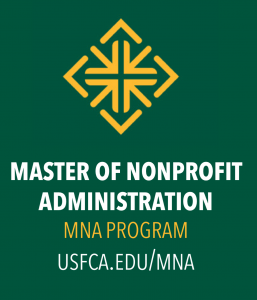 The Master of Nonprofit Administration (MNA) at USF's School of Management is a premier graduate professional program developing effective social sector leaders for the 21st Century. Established in 1983, it was the first graduate program to specialize in nonprofit administration, management and leadership. It continues to be the most socially innovative and globally engaging higher education nonprofit program in the San Francisco Bay Area.